Marsha Dunstan makes photographs and videos with ambiguous, fragmented narratives that are located on the thresholds and in the spaces of the everyday. 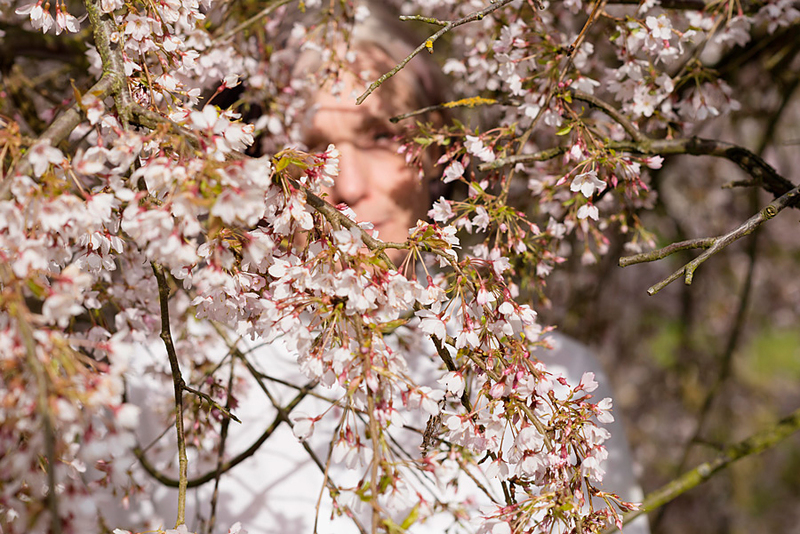 She is attracted to the tension between semi-domesticated nature and the built environment, where the pink flowering cherry tree is a recurring and unruly feminine presence in her urban landscapes. In her continuing series, Dissolve, the 19th-century docks of Canary Wharf reflect the ephemeral traces of the physical and economic might of the modern financial district in London. Her photographs touch on circularity and transformation, intimations of vulnerability and the nature of visual seduction. Born in Australia, Marsha Dunstan has lived and worked in London for many years. While pursuing a career in newspaper journalism, she studied drawing at the City Lit. She gained her BA (Hons) at Wimbledon College of Art in 2007 and her MA (Fine Art) there in 2009. Her work is represented in public collections in the UK, including Vital Arts and the Canary Wharf Group, and private collections in the UK, Germany, Belgium, Australia and Colombia. 2014 Dissolve, the Schraube Museum, Halberstadt, Germany. Part of Monat Kunst Halberstadt. Dissolve, Long White Cloud, London E2. 2013 Under the pink tree, Vital Arts at the Royal London Hospital, London E1. 2012 Threshold, University Centre Milton Keynes Gallery, UK. 2014 CGP London Open, Cafe Gallery, Southwark Park, London SE16. 2013 On Site, Unit 3 Projects, London E3. 2012 Inter-action MK Open Exhibition, Milton Keynes, UK. 2011 London Group Open Exhibition 2011, Cello Factory, London SE1. Aggregate group exhibition and Open Studios, ASC Empson Street, London E3. Photomedia Open Salon 2011, Charlie Dutton gallery, London WC1. I-SHO, The Gallery, Edwards Lane, London N16. 2 normalcy bias, Listros Galerie, Berlin. 2010 Painting: A Question of Confidence, University Centre Milton Keynes Gallery, UK. Cabin Fever, Tupajumi Foundation at the Co-Prosperity Sphere, Chicago. normalcy bias, X-Ray at The Perseverance, London E2. 2009 MA Show, Wimbledon College of Art (UAL), London. Intersections, The Nunnery, London E3. 2008 Secret Lives, Rivington Gallery, London EC2. Approaches to What?, The Nunnery, London E3. 2007 Curve, La Danza Studios, London N1. Open Studios, Martello Street, London E8 (part of Arts Unwrapped). BA Degree Show, Wimbledon College of Art, London. Deutsche Postbank Exhibition, London EC4.2006Niche, the Crypt, St Pancras, London NW1. 2006 Niche, the Crypt, St Pancras, London NW1. Deutsche Postbank Exhibition, London EC4. 2005 Open Studios, Martello Street, London E8. One-Night Stand, A Gallery, London SW19. Deutsche Postbank Exhibition, London EC4. 1st Biennale / Monat_Kunst_Halberstadt _ Dokumentation/Catalogue (published 2015). an Magazine – November 2011 (‘Make Digital’).